Part of the Madrid, Labs and Factories teams celebrated its Different and Responsible Day. 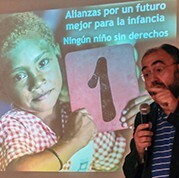 In addition to team building and cohabitation for the team in a friendly environment, this year’s event included a talk given by José María Palazuelos, Secretary of Madrid Committee for UNICEF. UNICEF’s presentation to the team had the purpose of explaining first-hand the activities that the organisation is carrying out within the “Multiply for Childhood” Programme, which Tradecorp joined in early 2016. More than 70 people attended the event, including adults and children. Multiply for Childhood is a UNICEF initiative with the purpose of gathering resources for children’s education in Africa. The funds raised in this programme are for “Schools for Africa”, a project founded in 2004 together with the Nelson Mandela Foundation and the Peter Krämer Foundation to create Child Friendly Schools. Child Friendly Schools provide a safe and protective environment for children to learn and play in 13 African countries (Nigeria, Burkina Faso, Guinea Bissau, Sierra Leone, Mali, Ethiopia, Rwanda, Malawi, South Africa, Angola, Madagascar, Mozambique and Zimbabwe). Moreover, the offer a series of resources, such as water supply, health care, food and health care facilities, not only enabling quality education, but also contributing to community development. Visit us at the New Ag exhibition in Kenya, from March 21-23!